While suburban DC isn’t the Mecca of Asian food and supplies like San Francisco or New York, we are pretty lucky to have what we have. I have gushed about Burma, Thai-xing and Mama’s Dumpling House, which are our staples. We have yet to find a true replacement for Four Rivers that was without a doubt the best Chinese food I have ever had. But, while we like going out, we usually are home for dinner. Near us in Rockville we are lucky to have three Asian markets. We have a few staples that we can only find in the markets such as our favorite brand of toasted sesame oil, fermented black beans, mirin and large format bottles of our rice wine vinegar. Each market has a prepared section, but only the Kam Sam market seems to have a decent selection of veggie items along side your typical rare organ meats, strung up Peking ducks and squid. The same women have manned the counter since we started going decades ago and by now they know exactly what we want when we get there and we don’t have to explain the vegan thing to them since the language barrier is huge. We are generally the only ones not speaking Mandarin. It is great in a pinch if they have all our dishes and can be a quick meal. I am not 100% sure that there isn’t some MSG in the stuff, but we don’t eat it all the time. I think I have stated before that in the restaurants and groceries we frequent, having kids is a big plus. These cultures love children and our kids are so into the food and going out that the mutual enthusiasm feeds off of each other. It isn’t unusual for the kids to disappear into the back kitchens or offices with the adoring staff. They always come back smiling and having had a window into something we as parents don’t get to see. I think they really like the idea that they have their own special relationship and comfort that is just theirs. 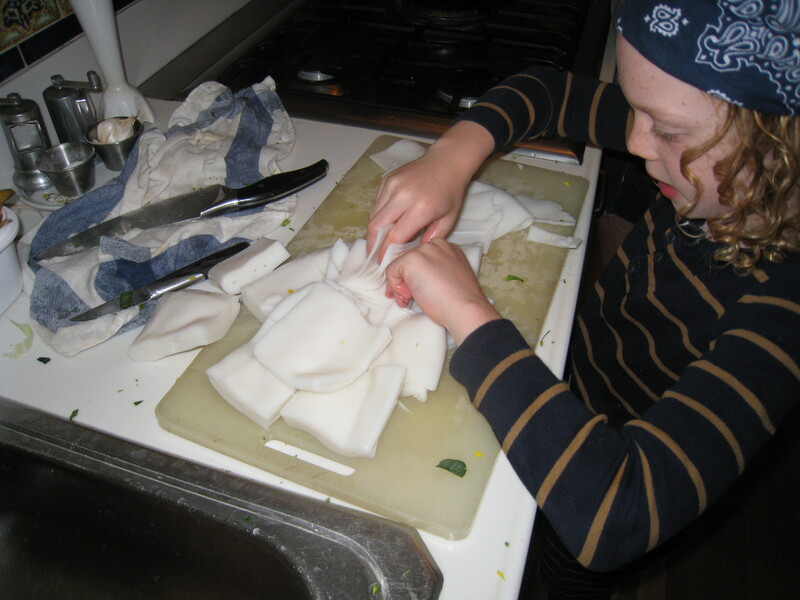 One common thread in many of the dishes we get in our varied Asian foods is a fat fresh rice noodle. Having had it in so many different places we knew that everyplace couldn’t possible make them fresh each day. Luckily my sister found the source. China Boy, a block away from Restaurant Burma in DC’s Chinatown, seems to be the area supplier. 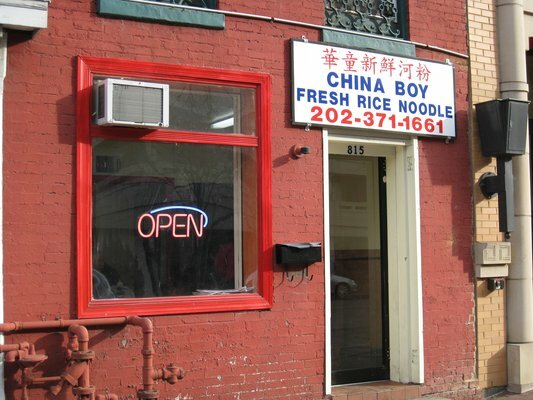 This little unassuming brownstone cranks out the noodles for DC, Maryland and Virginia. While my sister lives only blocks away, it isn’t easy for us to go to china town to shop for only noodles. As a matter of fact, it is rarely open when we are there. 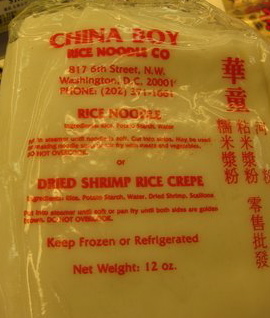 It was with great delight that on a random visit to Kam Sam market in Rockville we stumbled across the China Boy packaged noodles in a little bin on the floor hidden away under some dried shrimp. They have changed our lives. Our normal noodle consumption is limited to a few gluten free choices since Virginia has Celiac. You can get dry rice noodles almost anywhere, but we have a hard time eating them since they aren’t as healthy as whole grain pastas. That is out the window when we can get the silky fresh rice noodles from China Boy. They are insanely good and I have never been able to make a great white rice noodle at home from scratch. We usually make them loosely based on the Thai style. The Kam Sam also has some decent fresh greens that you don’t get at the normal grocery store. 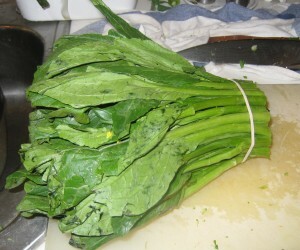 Pea shoot greens or mustard greens are awesome and can add a little zing. It is now Asparagus and garlic scape season and Twin Springs has the most amazing supply for a short window. This time of year we also get green onions and bok choy from Twin Springs as well. 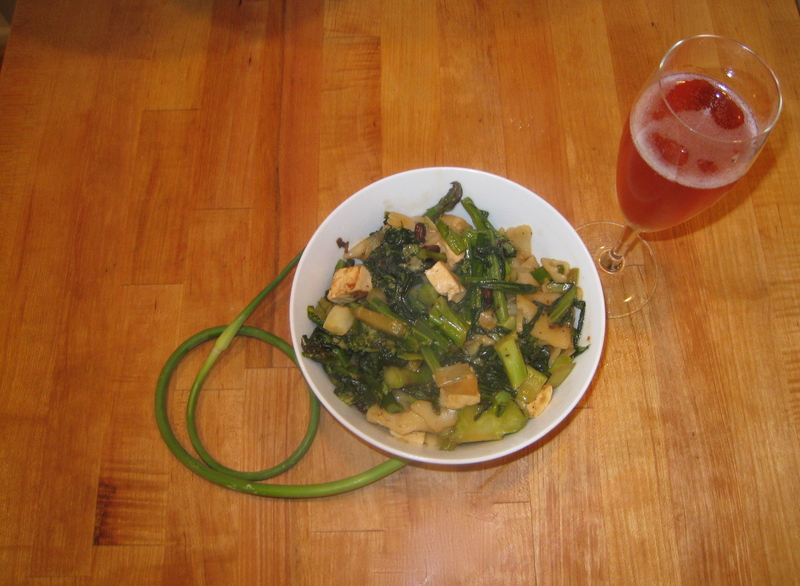 We then use whatever else we have like broccoli and red pepper and extra firm tofu. 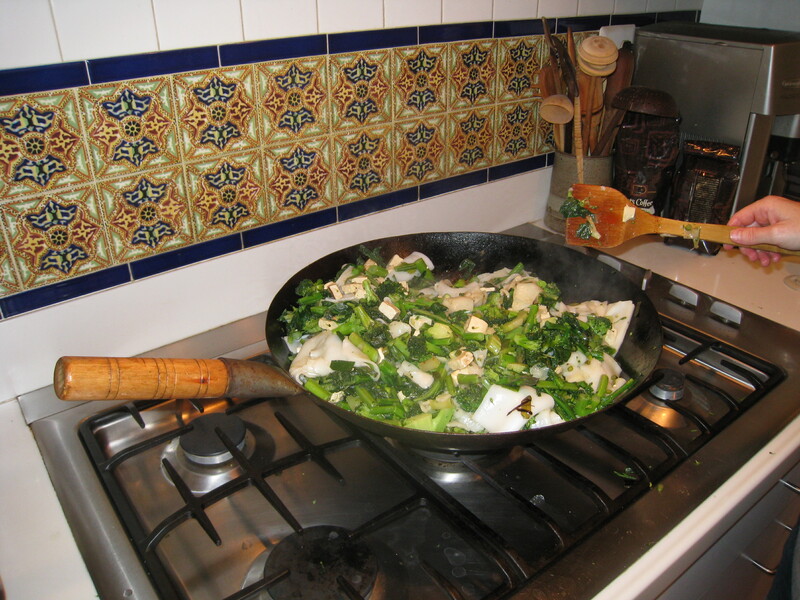 Everything is cooked in one wok with grapeseed oil at the highest possible temperature stirring frequently. When the veggies are close to done we add the rice noodles. These are really hard to cut as they come in large sheets. They are supper slippery as they are coated with oil and sometimes breaking them apart takes some effort. I like when we mix them to the bottom of the wok and they get a little crispy. The sauce really dictates the style. Usually we use gluten free soy, fermented black bean and sesame oil. If we want a heavier dish we can do a coconut milk based sauce with curry. Basil is always a good addition at the end of the cooking and the smells are is insane. When it is almost completely cooked we add the sauce, as we don’t want the veggies to steam with the moisture of the liquid. We add hot sauce to our own dishes so we can tailor the spice and with a crisp sparkling rose from the Jura region in France we have our China Boy fix. Kenan, c’mon. It has been three months and no updates. Enough slacking! Thehousedaddy is a one time restauranteur who is lucky enough to stay at home with his two boys and wonderful dog. While we are generally crazed with ski racing, soccer, swim team, piano lessons, and school work, our world really does revolve around food. Fortunate enough to be a part of my kids' daily activities, I also spend a lot of my time shopping at our local farmer's market, exploring what to eat and cook next, and, importantly, what wine to serve with our meal. Everything we make and eat is vegan and for the most part gluten-free, but you don't need to be either to enjoy.